After the message Ed Martin came up to me personally with a special gift that he made. 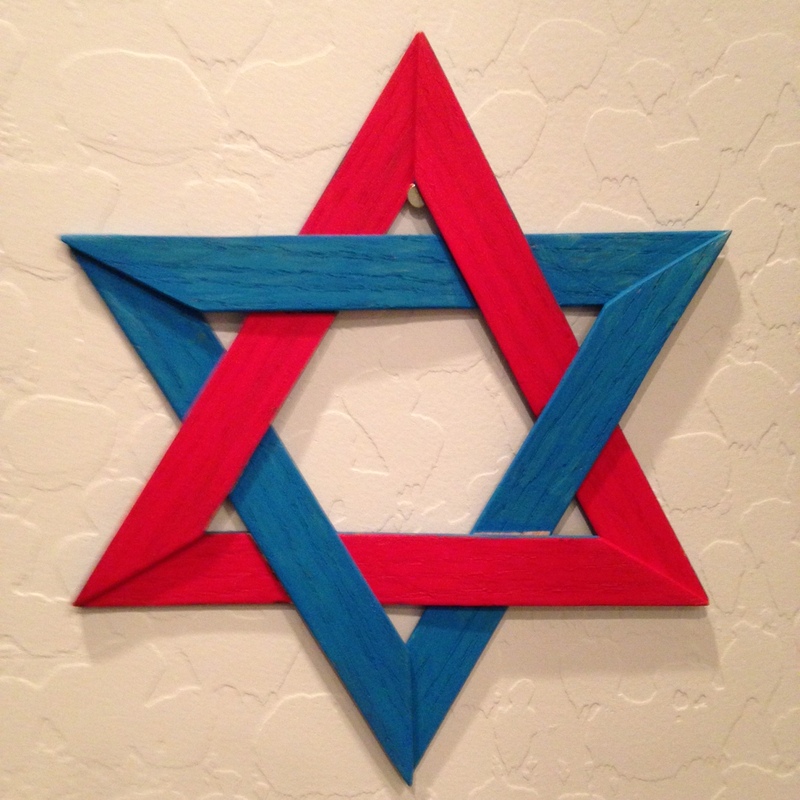 Ed for years has been making and giving away a special representation of one of the oldest signs of the Nation of Israel, the Star of David. When Ed presented it to me he looked deep into my eyes and asked “What does the Star of David mean to me as a Jewish believer?” I explained that it was the Star of King David and represented the Nation of Israel. Ed said he appreciated that but it meant much more to him as a believer in Christ. He said the star is made up of two interlocking triangles that cannot come apart when joined together. I was humbled by what Ed said to me as I now was seeing the Star of David from a different perspective as the Holy Spirit gave me a new way to look at the Star. God is Omniscient and He knew before the foundations of the world were made that the two groups of children that would come together through the Cross of His Son were Born Again Jews and Born Again Christians. They would be grafted together in the Cross of Christ to form the Eternal family of the Messiah. Our God is in the details of everything contained in the History that He has written. His pre-written history continues to unfold daily before our eyes. If you Love JESUS then you know in your heart that HE IS COMING BACK VERY SOON ! LET THERE BE LIGHT ! ! ! What do these images mean to you? For years Elyse and I always went to the Ann Arbor Art Fair. There were always many choices if you wanted to buy a Cross to wear around your neck. Then a new image began appearing. It was a large Star of David with a small Cross within its center. Some of my Messianic Jewish Friends bought the image. I chose not to because the image did not represent to me what Scripture Teaches. “The LORD did not set his heart on you (Nation of Israel) and choose you because you were more numerous than other nations, for you were the SMALLEST of all nations! The Blessing Promised to Abraham in Genesis 22:18 “In your seed all the nations of the earth shall be blessed” was not referring to the Jewish Nation. It was a reference to the Birth of the Coming Messiah of Israel. Who in turn would be the Blessing through the CROSS to all the nation’s. So out of the smallest nation on Earth GOD brought forth the GREATEST BLESSING to mankind. That blessing was to become BORN AGAIN JEWS and BORN AGAIN CHRISTIANS. Both together were grafted into the TREE that was planted DEEP into JUDEAN SOIL. The Earthly Tree of LIFE, the CROSS of the SON of GOD, the LION of the TRIBE of JUDAH, the JEWISH MESSIAH and the CHRIST of HIS ONE TRUE CHURCH. Tiny Israel became the WOMB of MESSIAH YESHUA, the Bread of Life born in the city of Bethlehem, the House of Bread. So I have these two images on the wall of Grandpa Ernie’s GOD ROOM. They represent what happened. 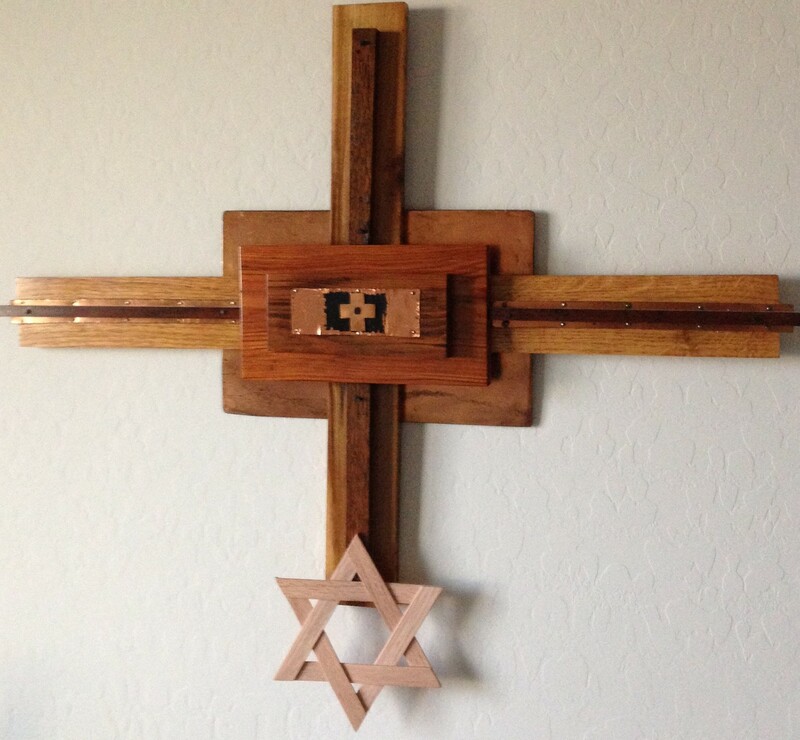 The CROSS is Large and the Star of David is Small. Eternal Life and Blessing is in HIS CROSS. As for what I wear around my neck it’s only the CROSS. Because when I stand before HIM, it will Only be the FAITH in HIS CROSS that will open the door to Heaven. Notice the Artist placed into the center of the Metal Star of David and the center of the Metal Cross, the Jewish letter that means LIFE….Chai. It’s appropriate to place the Chai in the center, for within the Heart of JUDAISM you will find the Heart of Your Messiah…..JESUS. 2 Symbols that Became ONE Gift, so we could have SALVATION. Through the years I have been given a few precious gifts from people. 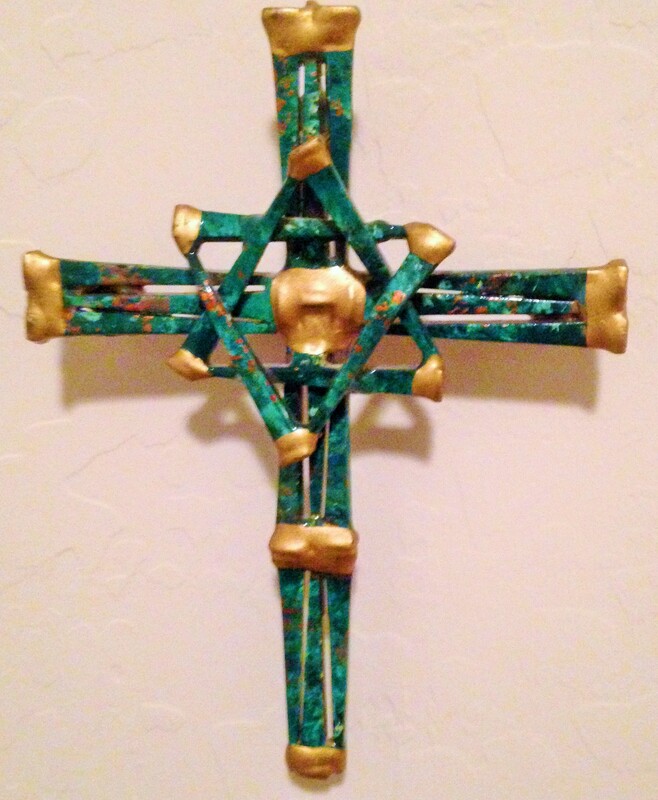 The Cross was given to me by a co-worker at a printing company back in the 80’s. I showed him a picture of a Cross I saw in a magazine that I wanted to buy but could not afford. He liked it too. He was retiring in 3 months from his job. The day came, and the company took 10 minutes to gather everyone to honor him. When it was over before he left he said he had something for me. We went out to his car and he presented me with the gift of the Cross. No he did not buy it. He made it for me. We cried tears of Joy together. He is my brother in Christ. 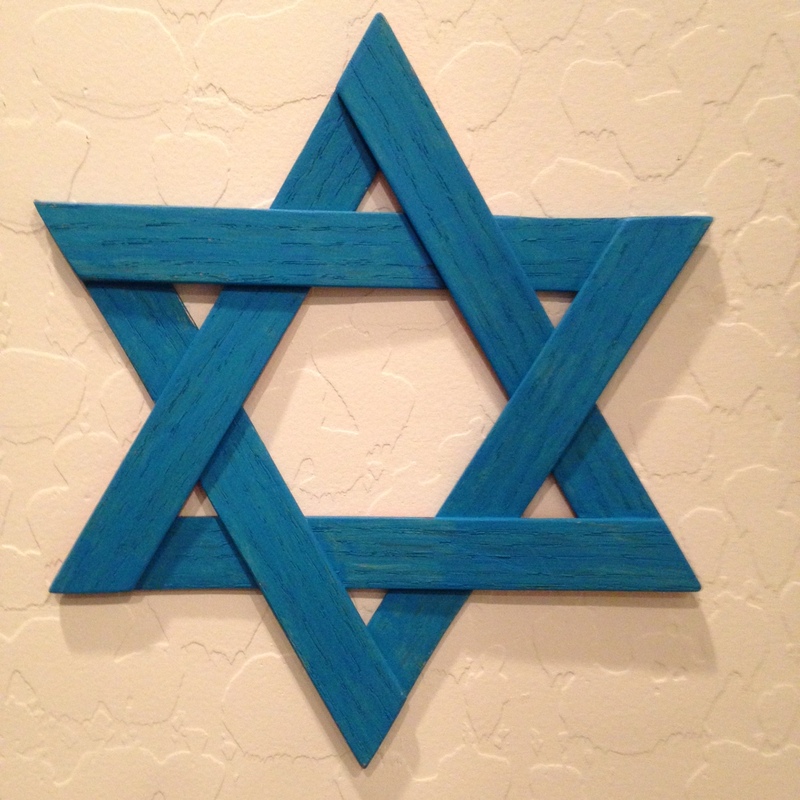 The Star of David was given to me by a person at a Church I spoke at. 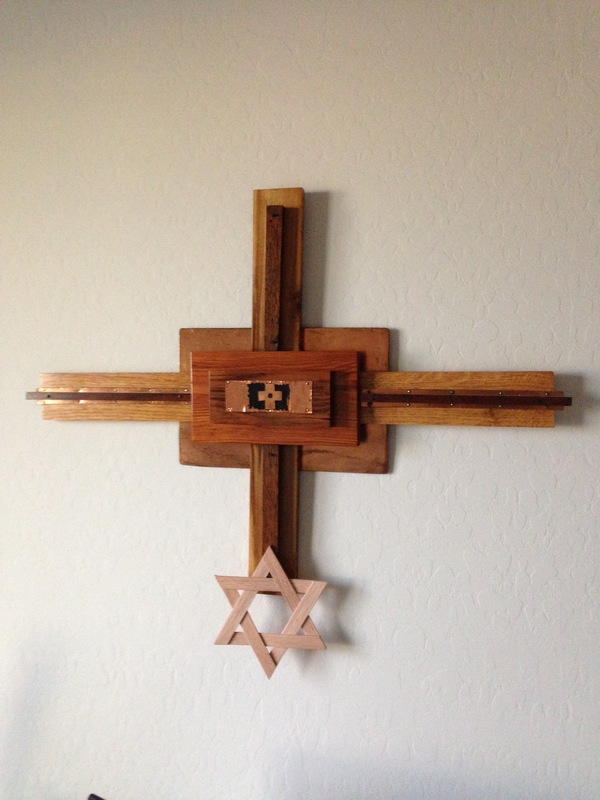 My message that Sunday was entitled “The Star of David and The Cross of Christ”. Two Ancient Symbols that came together in one moment of time to CHANGE the WORLD and YOU for Eternity. The man said he had been making the Stars of David for many years and giving them to Jewish people when he witnessed to them. He said he had just finished 12 more and could not think of someone better equipped to hand them out. He gave me a unique and different perspective as to the Christian meaning to him of the Star of David. If you have the time go to the Audio Category and listen to “Star of David and Cross of Christ”. I gave the message 3 years ago that tie the two Symbols together. I promise you that there is a significant meaning to the Star of David for Christians that I as a Jew never could have seen until he explained what the Star of David meant to him. It will warm your heart and fill you with JOY to hear this message. It’s ALL ABOUT JESUS…..not me.